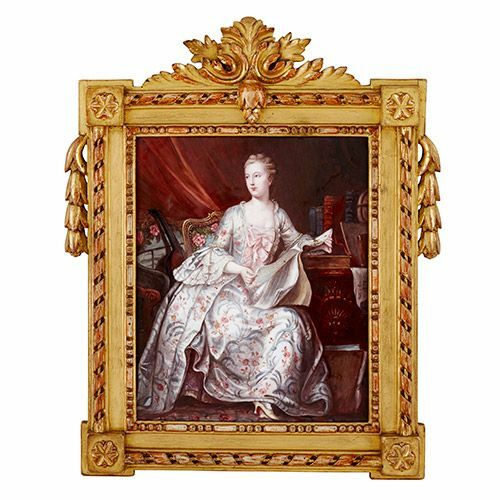 This beautiful Limoges enamel portrait was produced in the 19th Century and depicts Madame de Pompadour, based on Delatour's famous painting of 1755. This finely detailed Limoges enamel painting depicts a woman, wearing a white dress, decorated with light blue floral motifs, and pink roses. The cream-coloured heel she wears is just visible, poking out from under the heavy folds of her gown. She sits at a ornately-carved oak desk, upon which are several large books. The woman holds a musical score open in her hands, perhaps relating to the mandolin, which rests against the back of a chair to the woman's right. 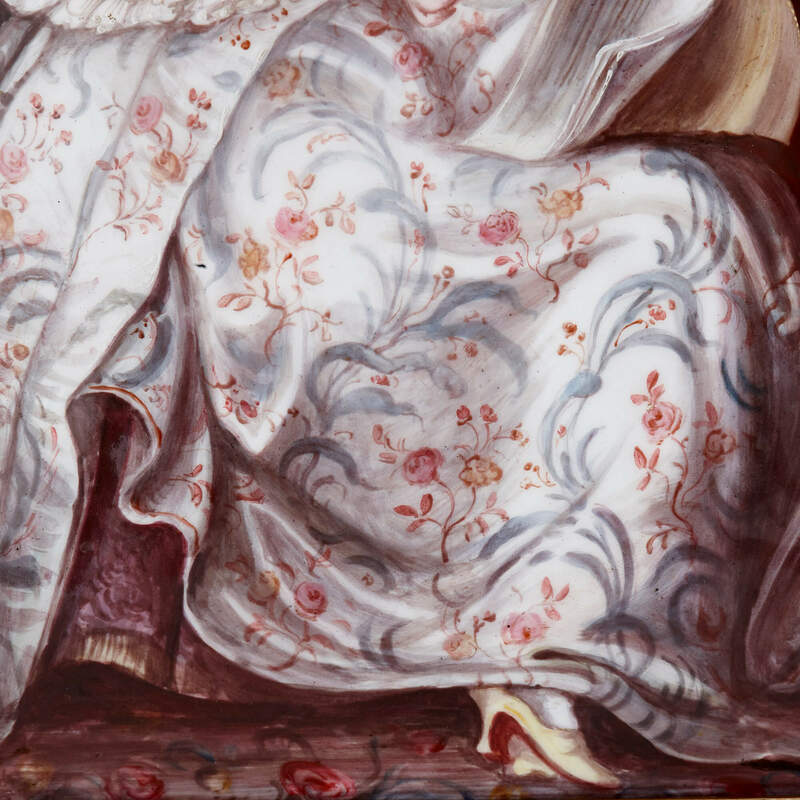 This chair, like that which she sits on, is decorated with pink roses, echoing those seen on her dress. A heavy red velvet curtain has been drawn behind the woman, creating a simple backdrop that ensures our attention is focused on the woman. The lady's features have been intricately painted, with small, well-blended brushstrokes. The smoothness of the woman's skin, and delicate curls of her hair, are carefully portrayed, while the heavy folds of her dress are painted in broader strokes, giving an impression of movement. 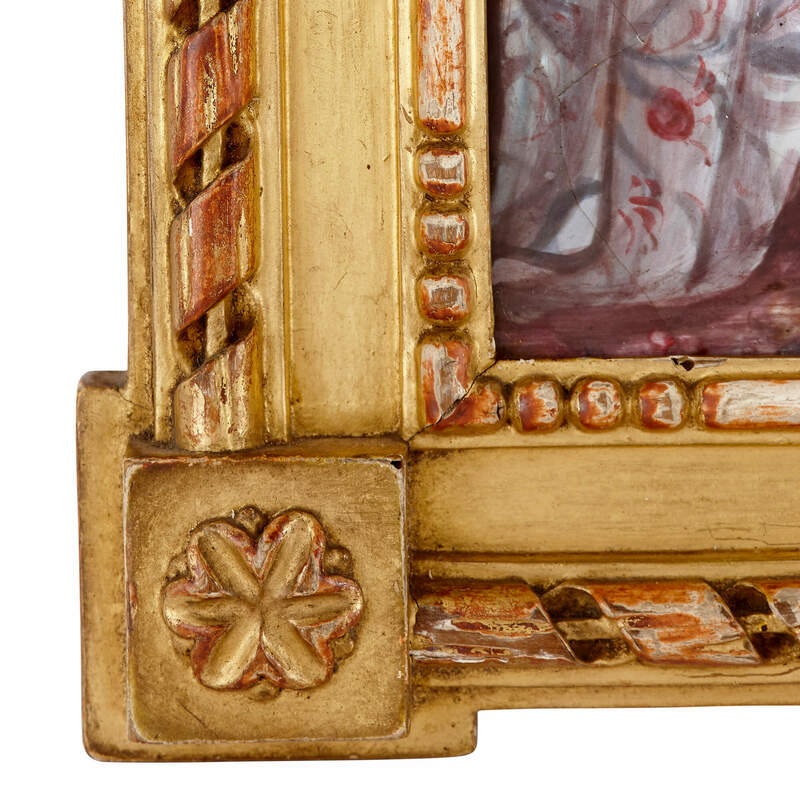 The painting is set within a giltwood frame, which has been carved with twisting rope forms, stylised foliage and flowers. 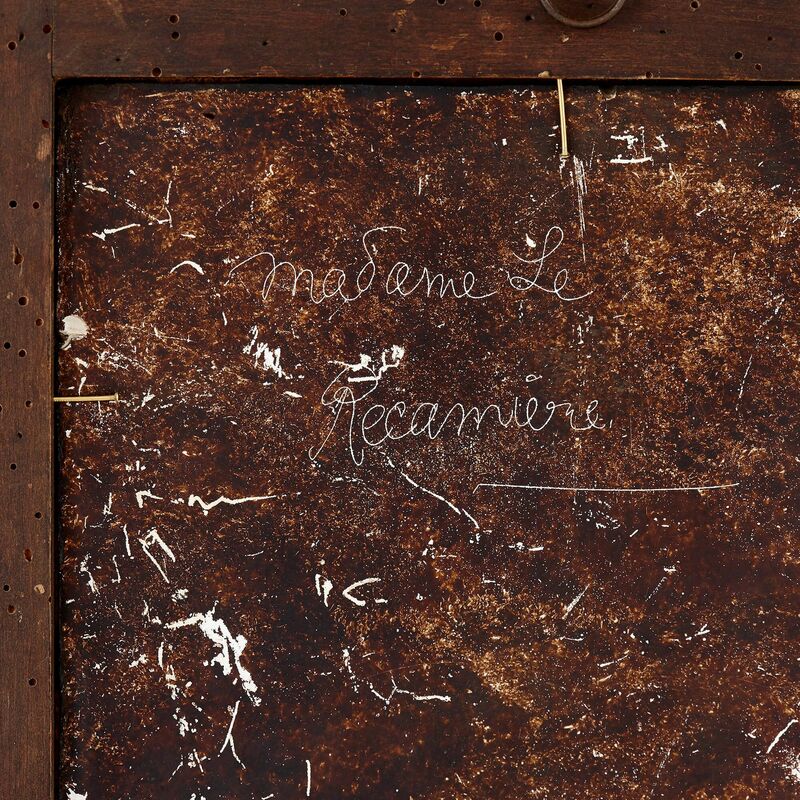 'Madame Le Recamiere' is signed on the back of the painting, likely done as a later attempt to identify the woman depicted. Jeanne Francoise Julie Adelaide Recamier (1777-1849), was a French socialite whose beauty was celebrated across Europe. Known commonly as Juliette, she befriended many artists and intellectuals, and received a marriage proposal from Prince Augustus of Prussia, which she declined. 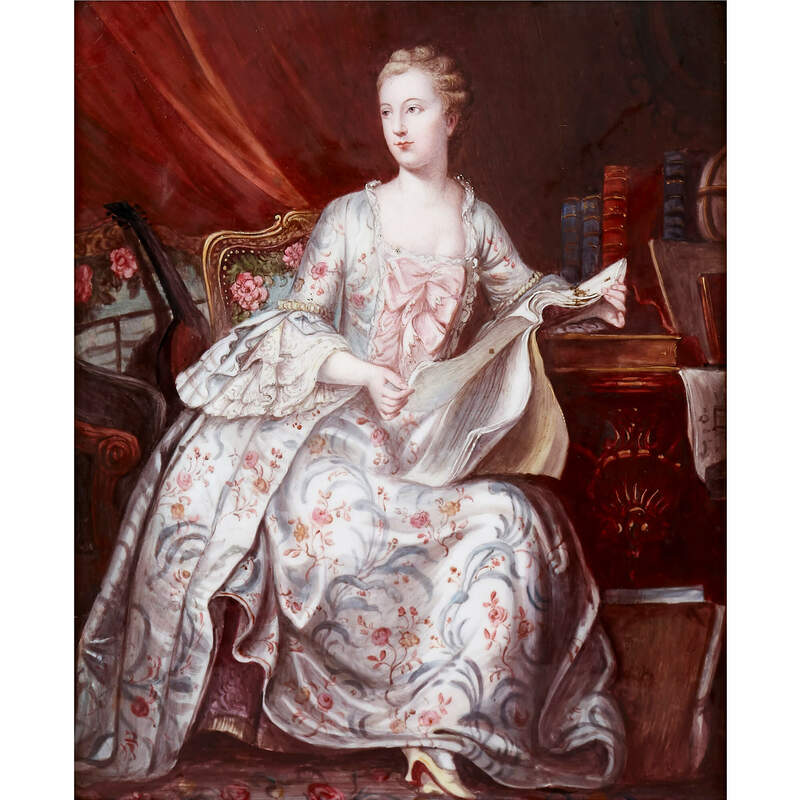 It is, however, more likely that the woman depicted in this enamel painting is Madame de Pompadour, since the composition is clearly based on Maurice-Quentin Delatour's well-known portrait of 1755. Delatour was a French Rococo artist, most famous for his pastel portraits of Enlightenment figures, such as Voltaire, Rousseau and Louis XV. 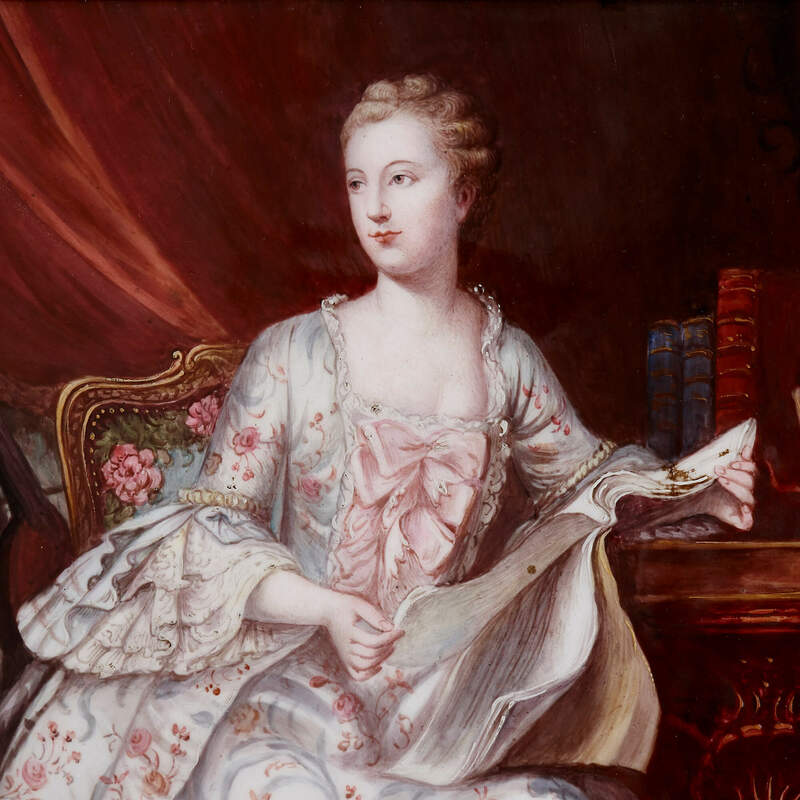 Jeanne Antoinette Poisson, commonly known as Madame de Pompadour, was a key member of the French court, and chief mistress to King Louis XV.